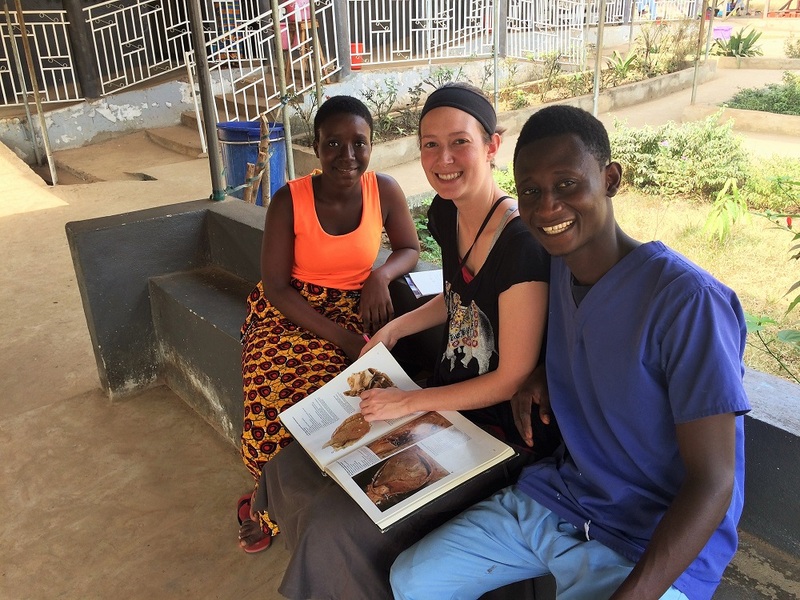 About a month ago Aminata came to our hospital with abdominal pain. She had been sick for some time so we treated her as usual for typhoid and malaria, but she did not improve. She had what felt like a mass in her low abdomen so I did an ultrasound and found what I thought was large irregular ovarian cyst. Whatever it was she was clearly deteriorating and needed an operation despite her weakened condition. At the time of surgery I found a huge pelvic abscess. No ovarian cyst, just lots and lots of pus. I never could identify for sure the source, so I washed her out, put drains in and closed her up. And prayed. Before, during and after the operation. Because often that is what is needed as much or more than the surgery itself. Now, more than a month later, Aminata is about ready to go home. I closed her wound last week and she is off all her antibiotics. She has been a special patient, she has a ready smile, and a sharp wit. She loves to laugh. She loves to dance, with me. One day she was sitting outside her room on the veranda and when she got up to walk back inside she grabbed my hand and started to dance with me, just to show how much better she was feeling. I must say we were a hit with the rest of her large family, the other patient families and the staff who were around to see it. She has promised me one more dance before she goes home. Kai-Kai , the little stuffed rodent. 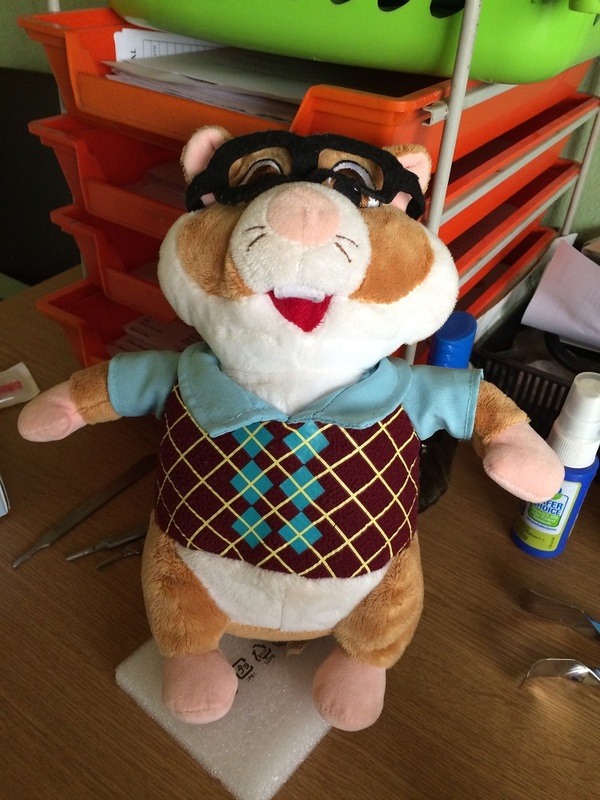 Today she surprised me with a little stuffed rodent of some sort, complete with spectacles (glasses for the younger readers). It is adorable. She told me it was for my office so I would never forget her, as if I ever could. I was moved to tears (well as close as I get to tears anyway). I named the little guy Kai-Kai and he is sitting on my desk in my office and watches over everything I do. Her gesture was especially meaningful because in 60 days Bekki and I will be making a major change in our lives. We are leaving Africa and going back to the US on permanent return. (If you don’t want to count it out, it comes to April 22, 2018.) I have taken a job on the faculty of the Physician Assistant School at the Kettering College of Medical Arts, and the next term starts on May 7. I have to be honest I am very excited about this opportunity, it is a career change I have been wanting to make for a long time, and Kettering has a great program and a fantastic staff. Plus, it is a bit like coming full circle as Bekki and lived there in the late 1980’s during my surgical residency. And our son Jonathan was born right next door at Kettering Medical Center. That being said, there are many things I will miss after we are gone. Things like the absolutely best pineapple in the world (I kid you not), fresh papaya from our own tree, the cashews and groundnuts (peanuts). I will miss the special songs we have in Salone, “Welcome, Welcome, Welcome” and “Tell Poppa God Tenki”, to name a couple of my favorites. The acoustics in the Outpatient Department are amazing and when the staff really get going on a hymn they know well, the music is heavenly. But mostly I will miss the people here. People I have come to know and love and respect. In fact, the leadership here has asked us to continue to be involved with the hospital, be their US Ambassadors if you will. And Bekki is coming back in May to finish up the building projects she is supervising. But let’s be honest, there are a lot of things we won’t miss. It has been a hard four plus years for us here in West Africa, we have aged a lot. We have been separated from family and friends. In fact, Bekki and I agree it has been the hardest thing we have ever done in our lives. Are we ready to go home? Yes. Would we do it again, even knowing all we know now? Yes a million times over. Neither of us would trade our time in Africa for anything. Lindsay, ever the teacher, teaching anatomy to the staff. Being the melancholy sort, I often wonder how much of an impact I really have made here in Sierra Leone and in Tchad. I know that many of the administrative changes I have made will fall by the wayside after I leave. But this morning Lindsay, our daughter visiting us from Taiwan for Chinese New Years, reminded me of my patients. She reminded me of the privilege I have had for over four years, really over 30 years, of being God’s hands as He has worked through me to bring healing to suffering people. That is why the simple gift of a stuffed animal touched me so deeply. It is not just Aminata that little Kai-Kai (the stuffed rodent) will remind me of. It will remind me of all the patients that have allowed me to be a part of their lives, in Kettering, in Tillamook, the L-C Valley, Tchad and now Sierra Leone. Kai-Kai will go home with me on April 22, and will sit on my desk in my office at KCMA, and will remind me of what a special life I have been granted as a physician, surgeon and missionary for Jesus. For more frequent, up to the minute short updates, please follow us on Instagram or on Facebook, we are Scott N Bekki Gardner. For those of you who are new to our blog please look around at the other pages, the “About” page tells a bit of who we are and our background, the “Definitions” page explains some terms that are used that some of you may not be familiar with, such as GC or AHI. The “Timeline” gives an idea of where we will be throughout the year, and the “Video” page has a video Bekki made of Koza Hospital as well as the videos she has made of Moundou, and now we are adding videos of Sierra Leone. Watch a real Ebola survivor tell his story. Watch our community health officer explain why the staff agreed to work in the Ebola Red Zone even after they lost 2 staff members to Ebola. There is also the Surgical Pictures Page, but be forewarned, it has some very graphic pictures, so if you don’t like blood and guts, stay away from that page. On the Projects and Donations pages you can find the projects we are working on and how to donate to the project that touches your heart. Finally, if you like our blog and want to receive each new post directly to your e-mail, please sign up with your e-mail in the subscribe box. It doesn’t cost anything, there is no commitment, it just makes it easier to follow us. This entry was posted in Medical, Mission and tagged Lindsay, memories, patients. Bookmark the permalink. This post was especially moving as I recall the many wonderful stories you shared, happy, sad, funny, surprising, and inspiring. I remember seeing you at alumni w/e at BMA just before you left on this current adventure. It was exciting to see you headed into a God-inspired journey and commitment. I must say, I’m excited to see you come back, and enjoy your next God-lead experience. My brother is a grad from the Kettering PA program, and was one of the early program graduates, and he has enjoyed a 40 year career and retired a couple of years ago. I wish you well as you finish your work there in Africa. You announcement about you coming home.was not unexpected. Sometimes the challenges you face in a foreign culture seem overwhelming. It seems, for me, that once you’ve spent time in Africa there’s just something about it that gets in your soul. You probably know that Gene set up the Respiratory Therapy program at Kettering College. Blessings to you both in you move. If you happen to meet Jon Larrabee (maybe he was the one who hired you) give him greetings from us. They were very good friends from when we all lived in Maine. I hope you will visit Clarkston sometime soon!! !